lostpastremembered: Blackberry Apple Salad and a Giveaway!! Sometimes when the temperature hits 100º I long for a salad. Even history buffs like to take a break from antique cookbooks and dig into something crisp and delicious. On my England trip, one of the things I saw a lot was the combination of apples and blackberries. They go together beautifully. I have been making a blackberry apple pie for years and love the flavors together. But there will be no baking for me today, not in this weather. Thanks to the wonders of science, we know that humans have been eating blackberries for at least 2500 years since there were blackberries in the stomach contents of the Iron Age “Haraldskaer Woman” found in a bog in Denmark in 1835 (and checked into with modern technology a few years ago). There’s your history! Blackberries are a member of the Rubus genus, that is part of the Rosaceae family making it a relative of raspberries and roses… but you knew that, didn’t you? Although Oregon is the largest producer in the US, I got some local beauties in NYC this weekend. I just love them! Since I had received a lovely selection of salad dressings from Girard’s, I decided to turn my fruit into a fruit salad to try one of the dressings. It was delicious. The apple poppy seed dressing was a natural with the fruit. It is sweet with a subtle tang that went well with the salad and best of all it was ready in minutes. What do you put together when you are sweltering? Let me know and I will give away 3 sets of these lovely dressings (Apple Poppyseed, Champagne, Balsamic and Peach Mimosa) to 3 lucky readers thanks to the nice folks at Girard’s. I will announce the winners next week and they will send you your prize!! How cool is that? 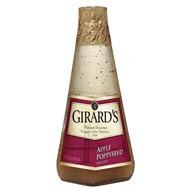 Girard’s Poppy seed Dressing to your taste. Toss the apple and avocado with the lemon juice. Put the arugula in a bowl or plate. Arrange the avocado and apple slices and toss the blackberries, pistachios and shallot around the top. Pour dressing over the top. Toss and serve! I have just broken 50 posts and 100 followers... thanks to all of you for making this so much fun!!!! A friend of mine got me hooked on Stonyfield farms yogurt (normally I don't like yogurt), so I often have a bowl of that with berries or granola. I also really like spinach salads with something tangy and something sweet and a light dressing. I don't comment often, and your food is usually way out of my cooking league, but I love your blog and the stories behind the recipes. Thanks for writing! I've never tried this particular combo, but will certainly give it a try. Looks and sounds beautiful! Thanks for sharing. I want to make this right now....well maybe lunch seeing how it's morning! Ha ha, I love blackberries, apples and avocados!!! Altogether is my idea of Heaven! Foodfun> it is really yummy. Madmoiselle>Smoothies are brilliant in the summer.... thanks for stopping by. Mikki: Yeah, organic yogurt is best and cool in the summer. My blog has been a bit of a bucket list for me... trying all sorts of unusual things and learning so much. Many recipes seem fancy but aren't. Even if you can't quite feel up to making them.. you can use them for ideas... that is what chefs do all the time.. borrow from the past! Lorraine> It is funny when you write about cool we are freezing and vice versa... this is a great salad for a hot day...and so pretty! Sara> BLT's are my favorite breakfast...well actually BTs! French Bear> You go girl... what's wrong with salad for breakfast??? This is fantastic - especially the history of blackberries! As I will be getting more blackberries soon from the farm, I will have to try this combination. When it's sweltering and I don't want to cook, I love a cold Sauvignon Blanc, some fresh goat cheese and fruit for dinner. When it's hot, I'll cook anything that doesn't require turning on the oven or stove so it's usually grilled. I really cut down on the carbs too so it's usually just a light meat or fish and salad or grilled veggies. This beautiful salad is making my mouth water even though it's breakfast time. And its presented so perfectly in your lovely cut glass bowl. Nice giveaway as well. Try the chicken salad that I made, it was sooo good! Oh those are such pretty little blackberries! I also love that combination...especially in pie. Thank you Deana! Smart, creative and flavor packed salad. Congrats on all your success with your blog. You really do a wonderful job. Awesome and good looking salad. Congrats on 50 posts and 100 followers, that's really exciting! Blackberries and apples looks like a combination I definitely need to try! Iced tea is my go-to drink....all day. Light salads are the order of the day for lunch. And this one really looks lovely, Deana. Blackberries and apples pair together so well! I just won a Girard giveaway from Pam at Sidewalk Shoes, so don't enter me.... but it's a lovely gift! Beautiful salad! My treat on a sweltering day is sangria. I can drink a pitcherful. Team that up with tapas and I'm set - herbed olives, manchego cheese with my apple reduction, and homemade flatbreads - that type of thing. Stuff you don't have to cook in the kitchen. For dinner this sweltering evening, I made a Waldorf Chicken Salad. Nice and cool, as well as, crunchy! The blackberry salad looks so refreshing and delicious! 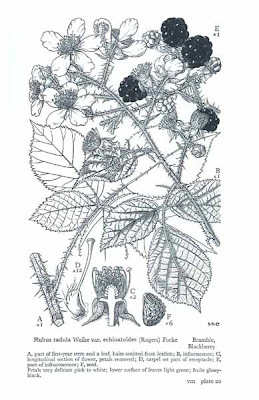 It's crazy that we KNOW that we've been eating blackberries well into our history. Really. Crazy. This salad looks fantastic! I love adding fruits to salad...gives them an extra kick! Your blackberry salad is beautiful. I love cottage cheese mixed with fruits in hot weather, and there's nothing like a cold sandwich loaded with sliced tomatoes and lettuce. And, of course, there's always a pitcher of iced tea in the fridge! I love a nice cold salad,potato salad, just a fruit plate or smoothies! Ohhh this looks lovely! I don't think I have ever had blackberries with apples...but it does sound fantastic! Great photos too! I have to say hot weather seems very far off at the moment! But when it's hot a salad of beetroot, fennel and orange really seems to hit the spot. Here in Maine we make Italian sandwiches- you take a sub roll, fill it with ham, american cheese slices, onions, tomatoes, green peppers, black olives and pickles. Then you add some salt and pepper and a little veggie oil on top and you've got your sandwich which tastes very good on a hot day! Mmm! This salad looks so fancy! On a hot day I crave salsa. Store bought or home-made. It doesn't matter! Lots of homemade ice cream!